Blue Bears Baby Crib Quilt Wall Hanging is a simple, elegant and versatile baby crib quilt that can also easily be used as a nursery wall hanging. The brand new, imported baby crib quilt has fleece on one side that shows off the intricate bear-theme machine quilting design. Backing is a blue cotton fabric. A sleeve at the top is ready to turn this elegant baby crib quilt into nursery decor. 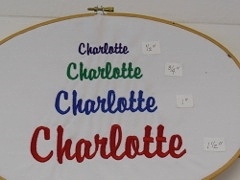 There is a spot at the bottom where you can easily add custom embroidery. Wash in cold; dry on cool. Additional customization available after adding an item to cart. Scroll down page and add "Custom Embroidery Letter" to cart. Our products make great personalized gifts and personalized home decor for a variety of occasions or to make an occasion special! 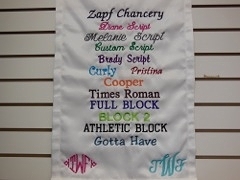 You can add embroidered names, dates and special wishes with custom embroidery to make monogrammed and personalized gifts out of quilts, throws and other products. Quantity is how many letters you need for your message. Set-up charge required once for each custom embroidered product. Rush charge available for embroidered products if you need delivery in less than 2 weeks.